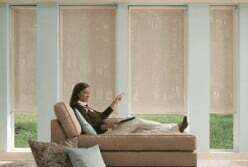 If you are thinking of having the custom window treatments in your home replaced with newer versions, you should consider Hunter Douglas motorized blinds. Not only will they look great in your house, they will be very easy for you to own and operate. In fact, the convenience factor is one of the strongest reasons you should invest in this technology, as you can set them yourself to open and closed based on the time of day and where you are in your residence. Whether you installed them in one room or all of them, you won't regret the decision! Control how much sun enters: Winter is a time of rising energy costs, which can help be reduced with motorized window treatments. When the sun is on one side of the house you can set the blinds to remain open — absorbing the heat — and have them close when it has moved to another side. Have a glare-free dinner: When you and your family sit down to enjoy a meal every evening, chances are you are dealing with glare from the setting sun. Instead of this discomfort, or having to leave the table to adjust the blinds, you can set them to have the blinds close at dinner time, and reopen later on if you like. Watch clearer television: If you notice that there is a blinding glare from the sun when you sit down to watch your favorite television show, close them with the touch of a button without missing one second of the action. If you are in the market for new Hunter Douglas custom window coverings, be sure to schedule an at-home appointment today with Ruffell & Brown!